Photography and Text By Capt. Ray Keeling (subscriber contributor) © All rights reserved. I started taking photographs in my early teens when I received my first 35mm rangefinder camera. During my college years I purchased a 35mm SLR and honed in on my skills while working as a staff photographer for the school newspaper and yearbook. It was a non-paying position but I was able to attend all the sporting events and school functions for free, plus I had numerous photos published with by-line credits. The only money I made via my photography skills was shooting seven weddings and selling a couple of photos to SW Bell and a now defunct sporting magazine. Then I got a real job and photography took a back burner in my life. The personal computer age and digital camera era brought me back into photography in 2001. After nearly twenty years in the same career field, my entire department was laid-off due to big cooperate buy-outs in November of 2002. Besides my photography hobby, I was also a serious recreational fisherman. With those two abilities in mind, I decided to start my own business as a saltwater fishing guide. Realizing that photography was going to play a huge role in making my business venture successful, I joined a local state writer's organization, Texas Outdoor Writer's Association (TOWA). At my first TOWA conference in February 2003, I was fortunate to meet a good number of Texas outdoor writers, photographers, editors, publishers and TV/radio media personalities. I brought a portfolio of my best fishing related photographs and showed them to anybody who wanted to view them. I also attended every photography/writing seminar available and came away from that conference with a renewed vigor to get my images published. That chance came a couple weeks later. 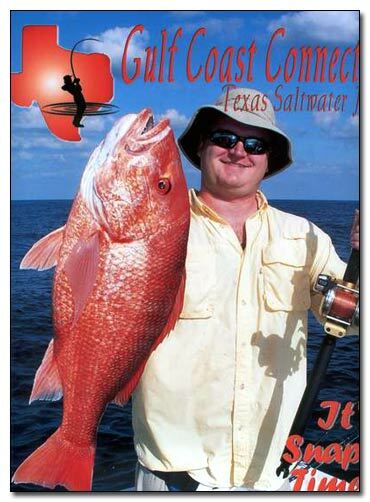 One of the local Texas saltwater fishing magazine publishers I'd met, asked me to submit an article for his magazine, Gulf Coast Connections. He wanted it to cover how to take better fishing pictures using examples of my photography. That piece led to a follow-up article and more photos in the next issue. In May of 2003 I was asked to write an offshore fishing article using my photographs. Of course I jumped at the opportunity. I've now been writing that monthly offshore section for a year now and average 3-5 published photos per article. That year's worth of writing those monthly offshore articles was just rewarded by getting my first ever cover photo published in their June 2004 issue. The important lesson I learned during that time period was in order to get my photos published, I was going to have to write, write better and write often. If you want to get serious about publishing your photos, consider joining an outdoor writer's organization. It might be the way to get your foot in the door whether it's a state, regional or national organization. These associations aren't just for writers. They consist of members throughout the gamut of print media, radio/TV/video/film, and the Internet. Some of the common threads they share as members are striving to make their craft better, learning, sharing new and old technologies while networking together as a cohesive organization. Most of them have web sites with names and contact information of current members. Within these sites are their mission statements, codes of ethics, membership benefits, message boards, job postings, field trip outings for active members, articles on craft improvement, monthly newsletters and yearly association conferences. The two TOWA annual conferences I've attended yielded a wealth of information and many new friendships. This year's TOWA conference featured Michael Furtman, a well-known nature and wildlife photographer as well as book author. Not only did he deliver a fantastic seminar on digital photography in outdoors publications but also was accessible one-on-one throughout the three day conference. Annual association conferences are geared to learn who's who while personally networking directly with the right people who are looking to publish your photography work. This is the time to meet the writers, editors and publishers who might need your photographs down the road. Be sure to take your portfolio with you and show it to everyone willing to view it. Other opportunities that most outdoors writers associations have in common are scheduled field trips throughout the year for active members. That might include a visit to a fishing resort, a guided fishing trip, a hunting outfitter's trip, a photo shoot at a public/private game reserve or bird sanctuary or any number of other outdoor activities. The purpose of these field trips are to get as much publicity coverage out to end users, both written and photographically. These outings are not only a great way to get a story and photographs but they are very economical ways to obtain publishable material. Many of these outings just include the cost of transportation to and from the site if you are an active member. These organizations might not be your cup of tea but if you want to get your outdoor photographs published and not sure what path to follow, these associations can be a fantastic road map to that end.